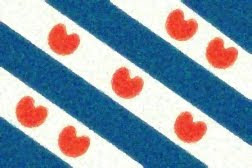 Fun With Frisian: SLEAT - "small canal"
That last lesson was more than a bit intense, so today I'll keep things light and share a small sampling of some Frisian words that look like English but mean other things entirely. Fonk (plural fonken) rhymes with the English word "honk." Fûnk (a variation on the same word) takes a long "oo like in "moon." This one looks like someone misspelled "sleet," but it is a useful word in the Netherlands, where these orderly waterways are everywhere! I think it is pronounced with a vowel similar to the long "oo" in "moon." An example: Ik joech him in dúst means "I gave him a push." A push into the dust maybe? I'll end with a few innocent words that can get caught on English-language censoring filters: fokker means someone who breeds animals, like horses, and fûke means a trap (there is a rather grim but excellent Frisian-language film called De Fûke based on the book by Rink van der Velde). The pronunciations are [FAWk-kuhr] and [FOO-kuh] respectively.